My publisher recently had it put on his heart to buy and run a non-profit Christian radio station in Gatlinburg, Tennessee as part of his Lighting The Way Outreach food ministry for the hungry. The radio tower sits on a mountaintop overlooking Gatlinburg in the heart of the Smoky Mountains. It’s one of my favorite places to go paint the view and be inspired. I started painting this 12 x 24 one day while I was actually on that mountain and later took it home to complete it. 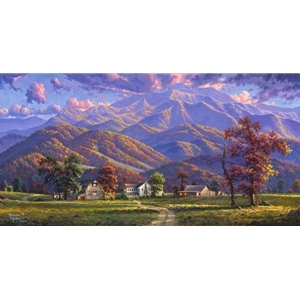 This is a real farm that stood under the majestic skyline of the Smoky Mountains in Sevier County. I used a reference photo taken of the homestead in the 1950s. This painting takes us back to a simpler time when the main sources of entertainment were barn dances, picking a six string on a rocking chair on the front porch, or just watching the sunset over the mountains after a long day in the field. I hope you enjoy this painting and I hope it brings you peace and the warmth of coming home.